Wall caps are useful for rooms needing ventilation. Home » Product Information » Wall caps are useful for rooms needing ventilation. When you need a hole through the wall for an exhaust fan or dryer, wall caps help to prevent water, insects and other pests from entering the home. A well-made wall cap does not interfere with the aesthetics of the home yet stands guard for many years to do its job. Wall caps can be made from many different materials, including aluminum, copper and plastic. Aluminum caps can be purchased in the natural silver color or in a painted finish to match the home. The copper cap begins with a natural polished copper color that eventually develops into a blue green copper patina. The wall cap is attached to a pipe that passes through the wall to connect to the appliance that is being vented. This pipe keeps materials such as dryer lint from collecting in the walls where it could form a fire hazard. 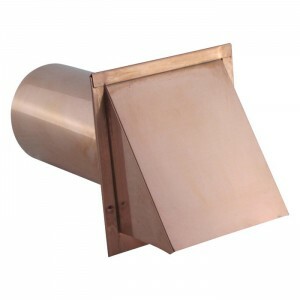 Wall caps can be used with an exhaust fan, which removes moisture, smoke from cooking and smells from the home. They are often used in bathrooms, kitchens and laundry facilities. The wall cap can be used with clothes dryers to remove the moisture that accumulates as wet clothes dry. In the kitchen, the cap is connected to the exhaust fan over the cook top to remove steam from cooking, cooking odors, smoke from burned foods and the oil and grease that evaporate into the air when foods are being cooked. In the bath, the vent can remove moisture from showers and baths as well as bathroom odors providing positive ventilation to the small area. Since most wall caps are used with some type of exhaust fan, they provide a closure for the vent when the fan is not in operation. The closure may be a single flap or several smaller louvers that open due to the positive pressure of the blower and then close when the device is not operating. This provides an important function of preventing wind from blowing back into the home and causing a cold draft. The caps connect with exhaust fans of many different types, to reduce moisture, odors and other problem substances from the air inside the home making it a more pleasant place in which to live. FAMCO provides wall caps as well as many other types of air ventilation and specialty products for the home. These quality devices can help to make your home a more comfortable place in which to live.